So you’re an individual in an organization that isn’t doing anything for NHDD, what can you do? ... The Pledge! We can all start with ourselves... including me! I did my advance directive about three years ago, and since then have learned that the person I chose as my agent hates hospitals. I chose this person because they are the most practical decision maker in the family so I thought it made sense if the situation arises where difficult decisions need to be made about my healthcare, he could be the one to do it. Well except for that thing about hating hospitals. So now we’re just two days from NHDD and I’m going to take the pledge to update my advance directive, and do my absolute best to discuss my wishes with my family. One of the hardest aspects of advance care planning for me in the past has been discussions with my family. Just the thought of it makes me slightly anxious. I think they hear me talk about how important it is so often that they don’t hear me. So I get disappointed, if I can’t talk to my family about my healthcare decisions, who am I to be advocating to anyone else about how important advance directives are? This is something Christian Sinclair and I have often discussed and as disheartening as it may be, sometimes your family sees you as just that, family, regardless of the insight you may have from your professional experience. Maybe you heard about NHDD for the first time in a newspaper article this week, or maybe you have been participating as a healthcare organization or professional for three years. 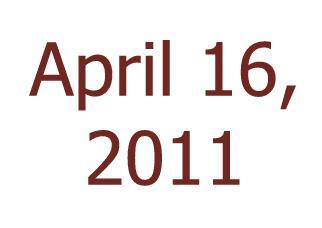 No matter what, you have a chance to make a large impact with over a thousand organizations and countless events on April 16, 2011. On that day in your city and across the United States, people will be talking about some of the biggest 'what if...' questions we can face as human beings. On first glance it can seem intimidating, but discussing your wishes for your own care should you become sick actually gives you control, and it gives your family a sense of peace in understanding what you want. So look for the events in your town, or start your own with our tools. If you have an interesting story, we would love to have you share it with us. It may even be featured on this site!